All too often one can get complacent about leaving his or her car in a sketchy place, such as a deserted parking lot or garage. While we can’t always avoid places like these, it helps to pay attention to the little things that will help make your car secure and protected as it is. Top Gear Locksmith and their network of licensed affiliates experts have rounded up five of the most foolproof ways you can protect your car from being stolen while out and about in Dallas. 1. Make sure you always know where your keys are, including your spare. 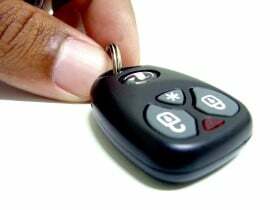 Misplacing your car keys when in a hurry can be a real hassle; to avoid losing them, hang them with a keychain that you can secure in your belt loop or leave them in one place in your house so you’ll always remember where to get them. Same goes for your spare keys. You can’t just leave them under pots or doormats if you think it isn’t secure enough, and at the same time make sure you don’t forget where you hide them. 2. Park in strategic places you know will be secure for both you and your vehicle. Check the perimeter to see if there are guards, parking attendants, CCTV cameras, and other vehicles in a parking lot or garage before leaving your car. If it’s late at night and no cars are parked, consider parking someplace else. Don’t leave them in dark alleyways or street corners that you feel will be unsafe for you to walk in. 3. Make sure all car doors are locked and windows rolled up fully, even if it’s hot outside. Don’t risk leaving windows open a crack. Windows that are left open even just a crack can attract the attention of burglars or thieves in Dallas. Before leaving your vehicle, check to see if you’ve locked it, and if your vehicle is a little old go around your car to check if no car doors can be opened from the outside. 4. Take valuables with you, or leave them at home. Never leave them in the car as they’re a temptation for thieves. Even if you think the tint in your windows is dark enough, you can never be sure. A nearby thief could be watching you from afar as you’re getting out of your car, so he or she might have already seen inside your vehicle. Stow heavy valuables in the trunk and small valuables in the glove compartment if you really need to leave them. Just make sure both are locked. 5. Don’t leave your car running especially when you don’t plan on leaving yet. While this is already illegal in most states, drivers still forget that they’ve left their car running on their driveway while running other errands inside the house. This makes it easier for thieves because your car is not protected by its usual alarms. If you’re interested to know more, visit TopGear Locksmith’s blog.